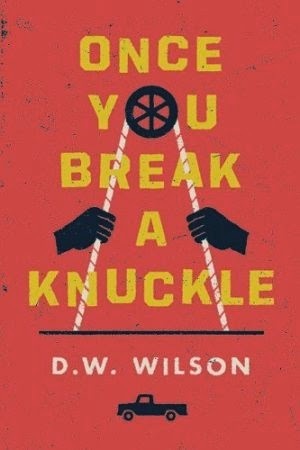 I found my way through about three quarters of the stories in D.W. Wilson's new collection "ONCE YOU BREAK A KNUCKLE" before concluding that I pretty much had the rough, blue-collar feel of working-class Western Canada nailed, and called it a rueful day. I'd been on a pretty good hot streak reading and enjoying unfamiliar authors who tackled similar terrain of the lost, the confused and the foregone, all living in misbegotten places far from our urban centers. Daniel Woodrell's "The Outlaw Album" was a good one mining this field for psychological pathos; even better was Jodi Angel's amazing "You Only Get Letters From Jail". Wilson's characters, all male and generally of good heart if not sound mind, work the construction sites and police forces of the Kootenay Valley in British Columbia, rubbing up often against the darker side of humanity: meth addicts, hockey-crazed dolts and troublesome and feisty women in many flavors. It had a lot to speak for it, including the NY Times review that made me buy it in the first place. That said, I found it to be overwritten, with too many flourished crammed into paragraphs, and a certain grating conversational rhythm that didn't strike me as particularly "real" - a cardinal sin when trying to convey the desperate humanity lurking below the surface in our fellow citizens. At times Wilson descends into "hick" dialect and story-telling mannerisms, which is all well and good, considering his subject matter, but it sometimes seems so ham-handed it makes me want to fly up to Invermere and see if the "puck sluts" and working stiffs of the town could truly actually converse in this manner. No question that Wilson's got some fine chops - I certainly didn't make it as far as I did in the book just to prove a point. He unwraps these seemingly tough men quite well at times, without having to take them through a crucible of pain or through major life events in order for us to get to some deeper sense of their missed opportunities and regrets. There are also some well-scripted portraits of dead-end towns, where everything fun more or less ends on high school graduation day, and adulthood comes crashing into full force as inelegantly as you can imagine, with quick divorces, unloved children and abandoned jobs in its wake. I see a few things to recommend in bits and spurts - just not in book length, I'm afraid.